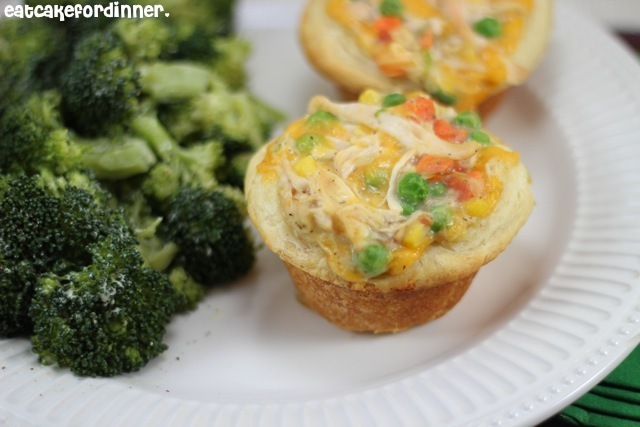 These mini pot pies are super tasty. They are extremely easy to make and the biscuit crust holds everything together, which makes them great for transporting for lunches or to a neighbor/friend's house for dinner. Once you cut into it, the creamy filling oozes out and the biscuit crust melts in your mouth. I don't remember pot pies ever having cheese in them, but it was a great touch. Serve with a side of mashed potatoes or steamed broccoli and you are good to go. Spray 8 to 10 muffin cups with cooking spray. Place a biscuit in each cup and press down and up the sides to form a cup. In a medium bowl, combine the chicken, cream of chicken soup, thawed vegetables, salt, pepper, garlic powder, onion powder and Cheddar cheese; mix well. Divide filling between biscuit cups. Bake at 350 degrees for 10-15 minutes, until biscuits are golden. Makes 4-5 servings, 2 pot pies each. Jenn's Notes: I used jumbo flakey biscuits and leftover rotisserie chicken. If the filling is too thick for your liking, you can add a few Tablespoons of milk. This looks just delicious! 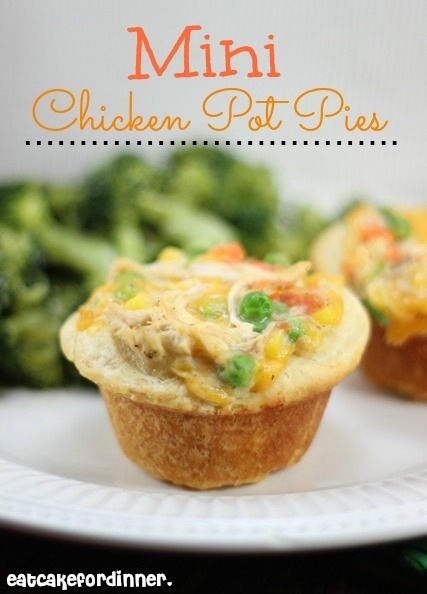 I love the idea of adding cheese, which I have never done for chicken pot pie! YUM! I'm in love with chicken pot pies--this looks like a gun version! I made a chicken pot pie for PI day! There are so many possibilities with this recipe. How did I missed PI Day? I made these for dinner tonight and my family LOVED them! My picky-eater daughter asked if I would add them to the regular rotation of dinners. This recipe is a keeper! Thanks, Jenn!!! YUMMY! And just the right size-- might have to make this for our next brunch in fact! Thanks for the idea and love your blog name of Eat Cake For Dinner-- I just MIGHT! Yum, these look so good and pretty simple, I think my kids would get a kick out of them! Thanks for sharing!! Looks delicious - my wife would love there! I'll try them and let you know! I have fallen in love with your site, thank you so much for all these wonderful foods! I'm trying this recipe along with your monster marshmallow cookie recipe tonight and am excited to see how it turns out!